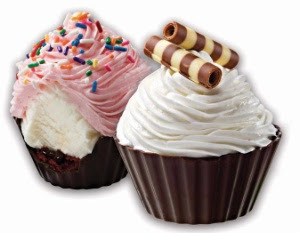 The Cupcake Activist: Cold Stone Cupcakes are Wanted by Everyone! Cold Stone Cupcakes are Wanted by Everyone! It seems that everyone is as excited about Ice Cream Cupcakes as I am. I stopped by Cold Stone Creamery last night to try the new cupcakes but they were sold out! The employee I talked to said that the cupcakes sell out every day. Even thought I was let down about the absence of Ice Cream Cupcakes, I figured that since I was in Cold Stone I might as well get some ice cream. I tried the Sweet Cream ice cream since it is inside the Sweet Cream Ice Cream Cupcake. I really enjoyed it and hope to try it in a cupcake soon. I have received comments from some readers who have tried the Ice Cream Cupcakes. Several of them have expressed disappointment that there isn't more cake. I like cake more than ice cream so I might have the same opinion. But we will see! One interesting thing to note is that the cupcakes are only sold in packs of six ($10). I was hoping that I wouldn't have to buy six of them because then I might be tempted to eat all of them. I tried eating them with a fork, it was difficult to get the chocolate cup, cake, ice cream and frosting in one bight. I then resorted to biting into it, which was more satisfying on the layered flavor level, but caused a cold jolt to my teeth (which are crowns over root-canals, so I can't imagine the pain that a healthy-toothed individual might experience. Too much frosting, not enough cake, the chocolate cup tasted like plastic chocolate. I think they should be made a little bigger, def. with more cake. I will probably not buy these again. Bummer! I have sensitive teeth too, so biting into one of these does not sound pleasant. At least you know you don't have to buy any more. Bummer, it sounds like the reviews are mixed! I do love the concept though. I work at Coldstone and make these all the time. We have to order the chocolate cups from some really far away fancy place, so our prices might actually go up soon to eleven dollars. We put everything together ourselves in the store... the cake, fudge, scoop of ice cream, we frost them, and package them. That can explain why there's differences in the amount of cake; we eyeball on how much to put in. We're only supposed to put an inch of cake so there's room for the scoop of ice cream without it overflowing the cup, it makes it hard to frost when it's so big. The more the ice cream overflows the cup, the more frosting needed to cover it, which makes them look big and weird and have too much frosting. Also, at least in my store (in Illinois), we customize the cupcake if someone asks us to. Say, if they want mint ice cream with chocolate cake, white frosting with a chocolate heart on top. We can sell them individually (for the price of a like it ice cream) by taking one out of the container or making one on the spot, but we prefer not to do that because it gets tedious with all the missing cupcakes needed to make a pack and it does take a few minutes to make on depending on what kind. But some Coldstones are different. Our bosses just really want us to always have a lot of each kind in the store. We have variety packs of 2 of each kind. Other stores barely bother. As for the "cake" issue, I think Coldstone is mostly trying to highlight the ice cream. Our cake is just a mix-in, its not supposed to be special. What makes the cupcakes special is the ice cream. That's why its in there, and not so much cake. And Becky, the LABEL on the top of the cupcake container had SWEET CREAM colored in, letting you know it was just sweet cream cupcakes in the container. At least, that's what I saw in the picture. A variety pack would have each circle colored in. I personally like them. I didn't have trouble eating one, probably b/c I had left it in the freezer to harden and then cut it in half (was sharing it with my boyfriend) and ate it. Mine was sweet cream with oreos mixed in and yellow cake. My favorite part was actually the shell. The dark chocolate was really good. It's just a creative way to eat the ice cream, a small version of an ice cream cake. Smarterjerk- Thanks for the inside information. I definitely like the concept of the ice cream cakes, but I, personally, am not much of an ice cream fan so I was hoping for more cake. I like Cold Stone's attempt to branch out more.